Droppings usually ranging from 1/2- 3/4″ long with blunt ends. These can be found along counters, cabinets, drawers, basement floors along walls, near food, under sinks, and in attics. Nesting material in wads approximately 8-12″ in diameter. Out side burrows ranging from 1.5 – 2 feet deep and around 3ft long with 2 or more entrances. The hole it self is around 2 -4″ wide. What can Eviction Nuisance Wildlife Control do to solve your rat problem? We Do Not Use Poisons to Control Rats!!!! So please don’t ask. 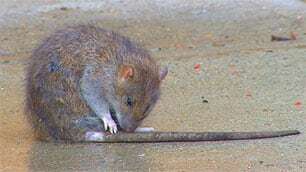 If you decide to use a company that uses poison, note rats do not go searching for water after they ingest it. Most times the rat will end up dying in a wall or other area of the home causing a foul odor that will remain until the decomposition process is done. We prefer trapping and exclusion. Once the determination of what has made your home a place rats like has been made; we will work with you to solve your rat problem. If you are currently having a problem with rats, then it is time to give Eviction Nuisance Wildlife Control a call today. We will inspect the area, and work with you to solve the problem.